I’ve been sick lately. And yes, I try to push myself and tell myself I’m not sick, which always makes me sicker. I should have learned after 27 years, but nope. Not me. The one thing that has made me feel better lately has been Andy’s soup. Yes, he can cook. I don’t like to tell too many people that. You never know, he could be better than me. (Shhhhhh.) But he does make this really great soup that’s actually Whole 30 approved. Which is actually how we stumbled upon it. When we were doing the Whole 30 in November, he made this. And it’s kind of become a comfort food for me. When I was curled up in a ball on our bed the other night, I begged him to make it for me. And he did. Because… well, because he’s Andy and he knew it would make me feel better. So what did I come home to the other night after working til the wee hours of the night? His chicken soup. Delicious! There’s no noodles, which is fine by me, but there’s mushrooms, carrots, lots of chicken, and broth. We’ve learned that we make the best pair when eating soup. I prefer bowls filled mostly with broth, he prefers them mostly with all the chicken, veggies, and such. So by the end of it, we don’t end up with a pot of just shredded chicken, or just broth. It’s kind of perfect. In a medium-large sized pot, combine chicken broth, ginger, garlic, and turmeric. Once it comes to a boil, reduce heat and simmer for 30 min. After 30 min, remove the ginger and turmeric. While heating the broth, cook chicken on the stove top with olive oil until cooked through. Remove from pan and, using two forks, pull apart the chicken until it’s shredded. 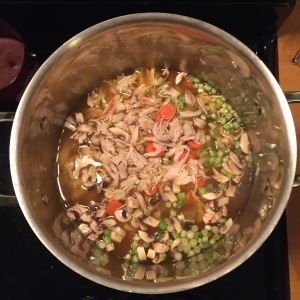 Add the chicken, mushrooms, green onions, and carrots to the pot. Keep on medium-low heat at a simmer for 5-10 min. Add pepper and salt to taste, soup can stay on stove on low heat to keep warm.